Rocky 2013 Program Book is available. Click here. Welcome to the eleventh annual Rocky Mountain Bioinformatics Conference, a meeting of the International Society for Computational Biology (ISCB). The organizers hope that you enjoy the program, and find the conference a productive opportunity to meet researchers, students and industrial users of bioinformatics technology. 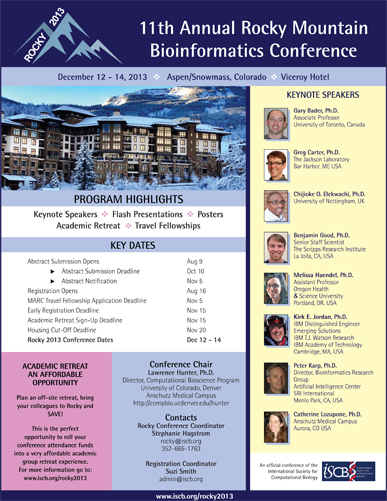 The Rocky series began eleven years ago as a regional conference, and has grown into an international program with a spotlight on regional development in the computational biosciences. The presenters of the Rocky conference are scientists representing a broad spectrum of universities, industrial enterprises, government laboratories, and medical libraries from around the world. The meeting is a chance to get to know your colleagues near and far, seek collaborative opportunities, and find synergies that can drive our field forward. Tales from the Crypt: Do You Know Where Your Data Has Been? JOIN OR RENEW NOW AND SAVE! Non-members and those whose ISCB memberships have expired will be able to join ISCB through the online conference registration system and immediately receive the member discount for Rocky 2013. You can either join when you register for the conference or do so separately in advance here: www.iscb.org/iscb-membership. In order to qualify for the member discount, your ISCB membership must be paid in full. Those preferring to register at the non-member rate will immediately be offered a free 12-month ISCB membership with their higher fee. Lunch is not included in the conference registration fee, but optional to-go lunches can be ordered in advance of the conference (advance order only; cannot be ordered on-site). Pre-ordered to-go lunches will be available for pick up at Noon on Friday and Saturday outside the meeting room. Lunches are $20 each; order default quantity is one unless otherwise noted. Lift tickets purchased in advance at Rocky group rates are offered at the following non-refundable prices. Ski Lessons and Rentals - Click here for discounted ski rental packages available for Rocky 2013 Attendee. Cancellations received by November 15, 2013 will receive a 50% refund. No refund of fees will be made on or after November 15, 2013. Rocky registration rates are among the most reasonable in computational biology, the conference hotel accommodations are under $105 per night, single occupancy. This makes for a very affordable retreat for groups. *Academic retreats are defined as a minimum of 10 or more paid Rocky conference attendees from the same school, staying in the conference hotel a minimum of two nights (single or double occupancy), and utilizing at least 5 sleeping rooms per night. All academic retreat offers noted above must be secured by November 15. 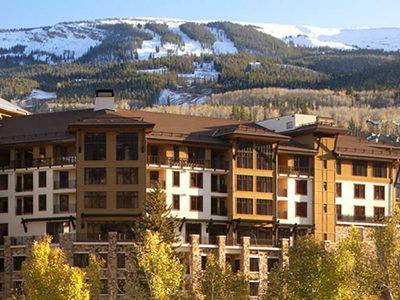 The Viceroy Hotel is a Luxury Snowmass Ski resort steps from the new Snowmass Base Village. There is ski-in/ski out to the Snowmass ski area and only seven miles from Aspen. Transportation within Snowmass Village is easy and free, with frequent service at the Village Bus Stop. Buses to Aspen leave from the end of the Snowmass Village mall. Taxes: The hotel rates will be subject to all state, county and city taxes in effect at the time of the Rocky 2013 meeting. State tax is currently 12.8% and is subject to change. Group Room Rates: Single occupancy $105.00 per night, Double occupancy $140.00 per night (limited double rooms available, book early). Roll away beds are available upon request. Deposit/Payment Policy: A 50% deposit of room and tax for entire booking is due upon reservation. The remaining balance will be charged upon departure or within 7 days of arrival whichever is first. Cancellation: Cancellations within 7 days of arrival will be charged the FULL length of stay. Prior to 7 days 50% of full length of stay. SPECIAL GROUP PACKAGES: PLAN AN ACADEMIC RETREAT! Earn a Suite Upgrade AND Free Food or Ski Lift Tickets PLUS one additional student registration at no charge with paid attendance of 10 or more from one school! Click HERE for details. Take I-70 west to Glenwood Springs. Take Exit 116 at Glenwood Springs, follow the signs for Hwy. 82 (right at 1st traffic light, right again at 2nd traffic light, onto Grand Ave./Hwy. 82, crossing bridge over Colorado River), toward Aspen. Follow Hwy. 82 for approximately 38 miles. DO NOT turn at the first sign for Snowmass (note mileage); this will take you to "Old Snowmass." Follow the signs for Snowmass Village/Snowmass Ski Area. Turn right onto Brush Creek Road at the traffic light, following signs toward Snowmass Village/Snowmass Ski Area. Viceroy Hotel - Hotel transportation is provided complimentary to the Viceroy Hotel (conference hotel) from the Aspen/Pitkin County Airport. Advance reservations for the shuttle are not required, a telephone is available at the airport to request shuttle service.